Get thrown out of the Silver Eel. Stop a mad god's avatar. Within this tome are fourteen Savage Tales to unleash on your wary band of rogues. Task your scoundrels to uncover the source of a mysterious red smoke plaguing the city before a guild war breaks out. Collect the Thieves' Guild's bounty on the notorious pirate known as "Black Skull." Or steal a holy relic out from under the watchful eyes of a rising church on the Street of Gods. 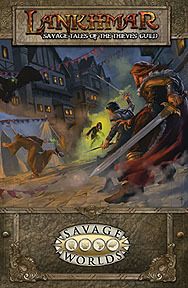 The adventures of Savage Tales of the thieves' Guild can be played independently or interwoven into an ongoing campaign. Each brings the City of Sevenscore Thousand Smokes alive and places your players in the thick of Lankhmar's dark alleys, shady dealing, and twisted schemes.